"OUR GOAL IS TO EXCEED OUR CUSTOMERS EXPECTATIONS"
Our team will disassemble your big rig to find all damage to the exterior and interior. Your estimate will be created, and then any necessary parts will be ordered as a repair plan is being determined. Your big rig's body will be repaired to fit all original factory specifications. We'll work on dent removal, scratch repair, frame repair and other repair to ensure it is safe to drive. Your big rig will move through the big rig paint preparation and application processes, where we'll match the color and texture to fit your existing paint job. We'll reassemble your vehicle and do our final quality control checks to check for any final fixes necessary. Your vehicle will be delivered for your final approval and payment will be finalized. Our collision center is fully equipped to handle all of you commercial fleet, motor coach and travel trailer repair needs. From painting to suspension maintenance and repair our technicians are trained to handle the specialized repair processes for today's commercial trucks. 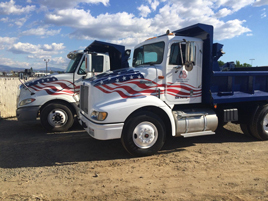 Big Rig Collision Center works on all brands of big rigs including: Peterbilt, Freightliner, Mack, Volvo, Kenworth,and many others. Big Rig Collision Center is pleased to offer complete repair on all makes and models with minor or major damage. Loaner hoods, exchanges and reconditioning are available. Call to learn more about the great discounts and competitive rates; and you can provide the parts. Big Rig Collision Center will honor competitive estimates and follow adjuster estimates. Offering free pick-up and delivery, on-site estimates and a lifetime workmanship warranty. Ask for a digital photo and they'll email or mail you a picture and you can see why Big Rig Collision Center should be your #1 Semi-truck repair facility. Offering complete sandblasting and refinishing of truck frames, trailers and rims; full frame and under bodies. Call to get a free on-site estimate today! Call Big Rig Collision Center to get pricing for a complete sandblast and paint service by qualified professionals for day cabs, conventional, cab overs, new, used and show trucks. They guarantee top quality and the shortest down time in the industry. Vinyl graphics are available for pin striping and lettering. Complete interior, exterior and aluminum detailing and polishing services are also available. Ask about the fender rock guard coating. Big Rig Collision Center offers state of the art equipment to get you back on the road safely. your truck. Call today for an estimate!